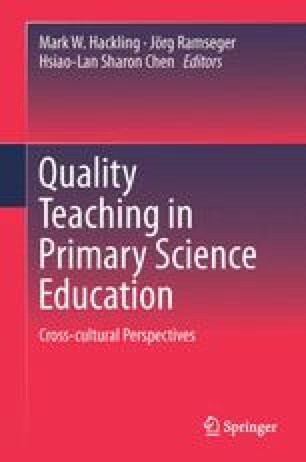 This Chapter considers how five, teachers who teach Years 4–6 in Australia and Germany utilised body-based strategies within learning sequences to facilitate the development of students’ scientific understanding. Video case studies were analysed by utilising social constructivist and social semiotic frames alongside complexity-theoretic perspectives of embodiment to investigate how gesture, role-play and distributed embodied strategies were exploited for specific pedagogical purposes. Micro-ethnographic, video-based analysis methods focussed on the role of embodiment as it was used within multimodal approaches to teach how day, night and eclipses are caused, as well as the principles of forces and levers. Fine grained analyses indicated that body-based strategies were introduced, adopted and elaborated by students and teachers as a result of their semiotic potential. Cross-case analyses showed that new information was linked to prior experience; space and time were pedagogically linked to support meaning making; and, perspective and haptic feedback were used to contextualise concepts alongside visual feedback through the use of these strategies. Implications are discussed for pedagogical principles derived from the analyses.